The connection set contains various T, I and end pieces, which extend the Kärcher Rain System™ and offer connection opportunities for additional Kärcher Rain System™ hoses. For further assistance please call 01473 636663. The connection kit is an expansion kit for the Kärcher Rain System™ efficient watering system and contains 4 T-connectors, 4 I-connectors and 5 end pieces. 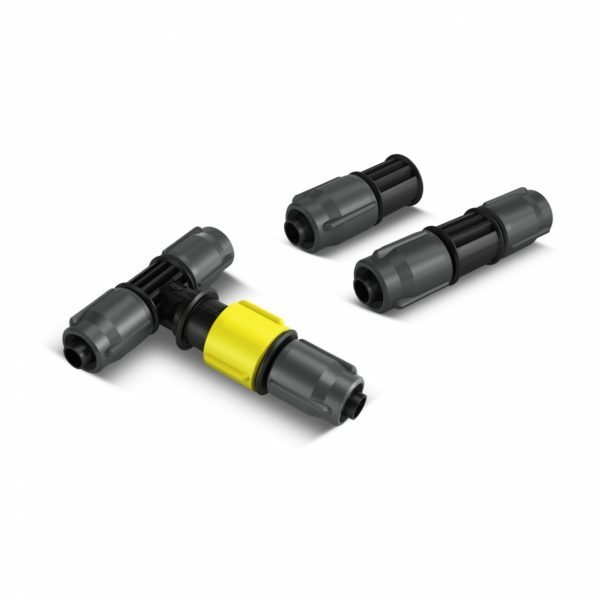 The T-connectors connect three Kärcher Rain System™ hoses or soaker hoses together, the I-connector connects two. The lateral tee of the T-piece is volume-adjustable and thus pressure-adjustable and is ideal for connection of the soaker hose. The I-connector is most suitable for affixing the soaker hose to the end of the Kärcher Rain System™ hose or to connect two Kärcher Rain System™ hoses. With the help of the end piece, the laid or shortened hoses can be sealed at any point. Installation of the hoses does not require tools and is extremely easy: The hose is simply pushed onto the connection or end piece and fixed with the aid of the union nut. The Kärcher Rain System™ can be adapted to almost any garden and works perfectly with the SensoTimer for need-based watering control. Convenient sealing of the Kärcher Rain System® hose or the soaker hose. Easy connection of Kärcher Rain System® hoses and soaker hoses.